Managed Print Services [MPS], Enterprise Output Management [EOM] and Document Strategy Design have all emerged to address the need to optimize the performance and expense of workgroup printers and copiers. These strategies focus primarily on cost control, especially when it comes to color printing. Rather than continue to support distributed laser workgroup printers and copiers, organizations instead leverage the economies of scale found in centralized multifunction machines and copy centers. 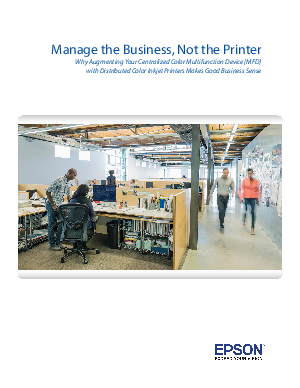 This guide explains a more balanced approach to print networks that leverages advances in printing technology to provide a cost-effective, beneficial alternative to centralized color workgroup laser printers. Organizations are now realizing that centralizing color office printing can mask hidden costs and inefficiencies. With a fresh look at centralized, color, and workgroup printing, it becomes clear that adopting a new hybrid printing solution makes good business sense.